Well you had to know that a What’s Cooking Wednesday recipe with Nutella was coming up . . . World Nutella Day 2008 is less than a week away! Don’t forget to post your entry on your blog and send the link and photo to nutelladay [at] nutelladay [dot] com by February 4th to be included in the big round-up! Yesterday my co-host of World Nutella Day 2008 Sara of Ms. Adventures in Italy posted her experiment with Nutella and a variety of fruits. Go see Sara’s recommendations on which fruits “go” with Nutella and which are, ahem, better off as just friends. Sara’s post got me thinking about my own World Nutella Day contribution from last year, which was a very understated slice of banana on a Nutella-coated cracker sprinkled with nutmeg. I wanted to bake something this year but I still love that banana and Nutella combination, so I turned to my trusty Louise’s Banana Cake recipe that I posted a while back and kicked it up a notch. With Nutella, of course. Mash bananas and set aside. Mix together sugar and shortening, and then add eggs and beat until pale yellow. Mix together the dry ingredients, and then add them to the sugar/shortening mixture, alternating with sour milk and vanilla. Batter will be thick. Add bananas and the nuts if you’re using them, and beat until blended. 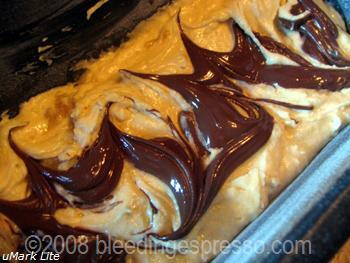 Then I poured more batter on top until the pan was 3/4 full and repeated the Nutella swirling process again. FYI, this used up about half the jar of Nutella. If you like more Nutella in there, by all means, go right ahead and swirl away! If baking a 13 x9 cake, it should take about 45 minutes; my loaf pan took about 45 minutes as well. The mini-cupcakes took about 20 minutes at this temperature, but always be sure to test–remove when the tops springs back from the touch and/or when a toothpick inserted in the center comes out clean. Buon appetito and remember to send your World Nutella Day entries to nutelladay [at] nutelladay [dot] com by February 4th to be included in the round-up! I wish we could start eating before you put it in the oven – that creamy goodness looks gooooooooood. Yum!! Sara, obviously we’re on the same page b/c truth be told, I consumed far too much batter and Nutella yesterday…raw eggs be damned! YUM! You can NOT come see me unless you bring some of those. Well, you can still come. Just bring the recipe! Dang those look gooood. Hmm…I think I’m sensing that maybe you might like me to bring these? I’ve had a lot of crepes with nutella and strawberries, but I never thought to bake with nutella. Yummy. Oh, this looks waaaaayyyyyyy too good! I have a flock of teens coming over the weekend – I think I *need* to make this! YUM! Now I have to get cracking on my nutella recipe. Can’t wait to see what you come up with Jen! MMMMMMMM – I can’t wait to try this!! I know what I am doing tonight! I Love World Nutella Day!! Glad to hear it Sandy! Let me know what you think! OMG that is heaven in a loaf! I need to try that. Oh yum yum yum yum. Must must try too! LJ, I have to agree on the yum x 4. I’ve already eaten *way* too much of this for just one person (and two dogs who can only have the banana parts)! Aw, I keep forgetting about that oven thing…someday though, right? How blessed am I, having a wonderful neighbour, that not only cooks, but bakes as well. Of Course there is no CALORIES right! Ciao Carla, when it’s baked with love there are *never* calories 😉 Thanks for the testimonial! oops sorry if this posts twice. I linked to Sara and your blogs about Nutella Day for those who need more information about this very important event. I am also making a Banana/Nutella recipe. They go so well together. 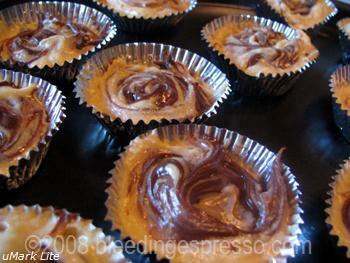 nyc/caribbean ragazza’s last blog post..World Nutella Day 2008! Mmmm. Save me some, I’m headed to the airport as soon as I find my passport! Fun fun fun with Nutella–enjoy Amanda! Woohoo! oh my! This looks heavenly. Decadent, but heavenly. Ohhhhh…banana and nutella. Sounds so delish! And all of your pictures look so fab 🙂 Big fan of the swirlies and the individual muffins!!! I’ll post my Nutella Day contribution this weekend…….it’s a recipe I’ve made before con nutella 🙂 that has always been a crowd pleaser!!! Eryn, can’t wait! Be sure to let us know where to find you! K, careful! No drooling on the keyboard! Yes Absolute and Atyllah! I hope you’ll celebrate with us! Mmm…I definitely agree with the Great Chocolate Chip Theory! if this is the start, i think i might just bake my way through world nutella day! i have my jars & am ready to tackle all these creative new endeavors…& i am working on a recipe of my own. thanks for co-hosting this event! Yes yes Qualcosa! Can’t wait to see what you come up with! This looks delish! Thanks for the heads up…. my husband would bathe in Nutella if he could. LOL. He loves it that much. Hah, bathing in Nutella…hmm…there’s a creative way to enjoy Nutella for World Nutella Day! Maryann’s last blog post..Daring Bakers, Expose Your Logs! *So* looking forward to some great crepe/banana/Nutella/whipped cream recipes for World Nutella Day! Nutella rocks! We had tons of it during a past Italy trip and have been hooked ever since. Thanks for the reminder and we’ll be getting some nutella soon. Happy Nutella Day! Yay for your new location! I love the look! And this sounds like it might possibly be the best thing I’ll ever taste. I love banana bread and I LOVE nutella! Oh my gosh, I’m so excited to try it! I LOVE nutella, spreaded, cooked, smelled or neat. Have you seen an Italian film by where the protagonist bathes in a giant jar of nutella? The Nutella banana cake will be mine. MINE. I may have Sunday free this week, depending on if I’m out walking (in the snow) for one day or two. If Sunday is free, then Sunday will officially be Nutella banana cake day in the Mikeachim household. Millions of people will come from far and wide, drawn by the smell, and the foundations of my rented house will crack and crumble, and my landlady will be hopping mad and it’ll ruin me, financially and also in a specific roof-over-head sense. 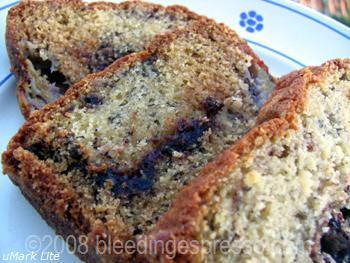 But by then, I will have had Nutella banana cake, so it won’t matter. Mikeachim’s last blog post..Webisodes, Lostisodes and Accountisodes: Inclusive Or Exclusive? OK but I will not be held responsible for any resulting homelessness or personal destruction. That reminds me—Note to Self: Write blog disclaimer. Enjoy the cake! There’s nothing for it but for me to go out and buy more bananas and nutella. I love Nutella! I think I will have to go buy a jar and make something on the 4th in honor of World Nutella Day. I also may try making that banana/nutella cake. That looks ridiculously good! 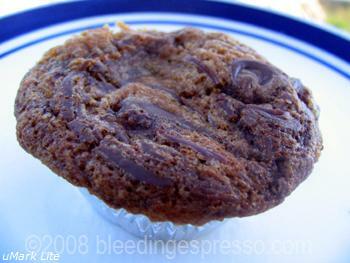 So I tried to make these muffins today – though “regular” sized instead of mini or in bread form. I don’t know what I did “wrong” but the batter I made was enough to make 3 dozen muffins! My batter also didn’t come out as dark as yours….but oh man, the results were just out of this world! I used a small ice cream scoop and put a scoop of batter into the mold first, then I added the nutella – spread that around with toothpicks – and then another scoop of batter on top! Baked it at 325′ for about 20-25 and it’s PERFECT! Thank you SO much!!! i’ve just made it the bbbbb-best one!